A call to the Monaco office of Fraser Yachts brings confirmation that Antoine Althaus has sold his central listing, the 52m motor yacht Latinou. 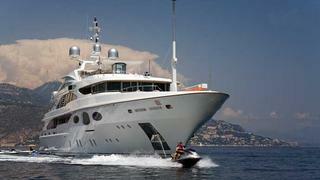 _Latinou _was built by Benetti in 2008 to both Lloyds and RINA class. Designer Mauro Izzo created an impressive Art Deco interior that accommodates 12 guests in a master, four doubles and a twin cabin. There are several entertaining and lounging areas including a formal dining room and an alfresco dining area on the aft deck. This superyacht is MCA compliant and has an elevator serving all five decks plus a range of 5,000 nautical miles at 12 knots. Latinou was on the market asking €39.5 million and has been renamed Latitude.